Researchers from the U.S. Department of Energy's (DOE's) Argonne National Laboratory are using nanomaterials to enhance the energy efficiency of the currently available single-pane windows in both residential and commercial buildings. Recently, the DOE's Advanced Research Projects Agency-Energy (ARPA-E) awarded the research team a $3.1 million grant for developing a technology that will help attain that goal. The team is developing a nanofoam called nanocellular composite that has soundproofing and superthermal insulation properties. This nanofoam uses gas bubbles that are less than 100nm in diameter so as to block the passage of sound and heat through glass windows while at the same time permitting the transfer of visible light and maintaining clarity, which is very much like the normal windows. That's really the trick, blocking the heat and sound transfer while maintaining transparency. It's fairly simple to develop a coating that insulates, but getting one that is thin and you can still see through is a substantial technical challenge. The nanofoam produces a thermal insulation by utilizing very small bubbles to minimize collisions occurring among gas molecules, thus decreasing the amount of heat energy transfer. It will be extruded into sheets that measure about 3mm thick. Superthermal insulation takes place when the bubbles are reduced to that specific scale. A foam containing bigger bubbles is capable of carrying out a similar function,; however, these bubbles will scatter visible light which results in making the window less transparent and hazy. The bubbles need to have a size of about 100nm or less. These bubbles also need to be accurately distributed and then sculpted within the host medium so that a preferred clarity level is obtained. In comparison to this, a DNA molecule is about 2-3nm wide and a strand of human hair is approximately 60,000nm wide. The DOE's ARPA-E has highlighted that the United States utilize 30-40% of single-pane windows based on the region. Single-pane windows transfer at least double the amount of heat as double panned and hence retrofitting all these windows could enable consumers to save around $12 billion annually in energy costs. The team of researchers integrates expertise from polymer scientists, nanomaterial scientists, process, chemical and building engineers together with the know-how from Argonne's Center for Nanoscale Materials, a DOE Office of Science user facility. Also included in the team are researchers from Temple University's Department of Chemistry, Lawrence Berkeley National Laboratory (LBNL), and the University of Chicago's Institute for Molecular Engineering. "This effort really shows the power of cross-cutting scientific collaboration," said Matt Tirrell, who is Argonne's Deputy Laboratory Director for Science and holds a joint appointment with the University of Chicago. "By bringing together these unique skillsets and facilities, we have the ability to make substantial breakthroughs that hold the promise to make a big difference in building energy efficiency." However, the researchers would not be satisfied developing laboratory versions of the materials. As a result, the team is also creating processes that are capable of being economically ramped up for production at the commercial level. 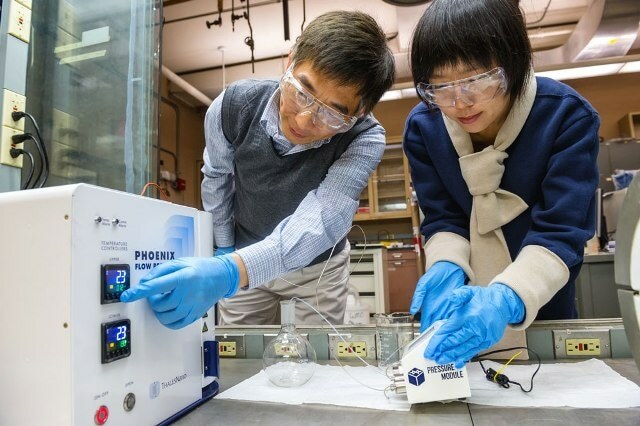 Recently, Jie Li, a principal chemical engineer at Argonne and the principal investigator on the project, concluded the DOE's Lab-Corps program, which focuses on speeding up the transport of clean energy technologies from national labs to the marketplace. We know that commercial production is the key step to having a positive effect on building efficiency. There are billions of square feet of windows in the United States. Imagine the impact of making all those windows more efficient. That's when you really start to see benefit from your science. Other researchers in the study include Leah Guzowski, director of strategic programs at Argonne; Yugang Sun, formerly of Argonne and now a professor at Temple University; and Stephen Selkowitz and Charlie Curcija from the Windows and Daylighting Group at LBNL. Another nanomaterial is being produced by the nanofoam team at Argonne. A huge number of members from the ARPA-E team are working towards developing a new nanoparticle coating of vanadium dioxide. This new material is a phase-change material that acts differently at varied temperatures. At low temperatures, the material acts like a semiconductor permitting both the visible light and the near-infrared light, which refers to that part of the solar spectrum comprising almost half of the all the solar energy. At hot temperatures, the material produces metallic properties and starts blocking the near-infrared light, which enables reflecting solar radiation during the summer. Much of the solar heat is not blocked by the existing versions of vanadium dioxide, and this highlights the necessity for the film to be extremely thick, which indeed makes for a darker window that customers are hesitant to accept. The research team used nanoparticles of vanadium dioxide to produce a film capable of boosting near-infrared blocking and that which has more efficiency at reflecting solar radiation while simultaneously maintaining visible transparency. The team hopes that the integration of both the vanadium dioxide and the nanofoam may help develop a single-pane window, which could attain efficiencies as that of multipane low-emission (low-E) units. Generally, low-E windows have multiple coated glass panes with inert gas introduced between them. The usage of just a single glass pane, instead of the expensive and complex sealing system needed by multipaned windows, could make the new windows more cost-effective and this in turn would lead to its widespread adoption.